Is it a flip phone or a candy bar phone? Does it support two SIM cards, or just one? Is it a senior-friendly phone or just a popularly priced cellular handset? 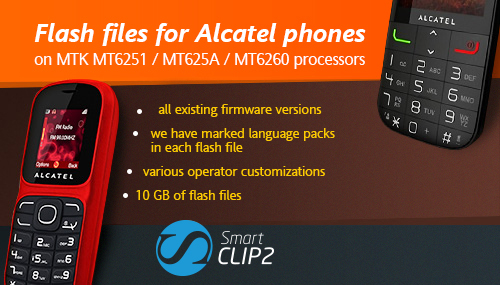 No matter what appearance your Alcatel phone has, now we have a full pack of flash files for it! Moreover, this is another FREE UPDATE, available for all Smart-Clip2 users! MTK Calculator update: More than 3000 new PIDs added for the specified above MTK phones. Do not forget to update your Box / Dongle and use the latest version of the software!